Home Recipes Mango Oatmeal Smoothie. I continue to experiment in the kitchen in search for the perfect healthy dishes. Not only must the dish be healthy, it must be tasty as well. The mango oatmeal smoothie makes the grade. It has only two ingredients, both healthy, ripe mango and thin oatmeal porridge and a pinch of sea salt to enhance the taste. I experimented by adding flax seed or sesame seed but the flavor of mango is so delicate that even a pinch of these seeds overpowers it. Working with ripe mangos is messy, be warned. After washing them to remove dirt and pesticides cut off the two "cheeks." Place the cheeks on a cutting board flesh side up. With a very sharp knife dice the mango cheeks making sure not to cut through the peel. 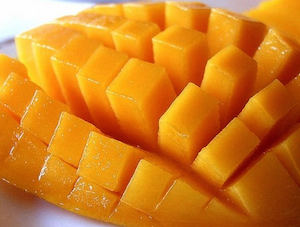 Squeeze the mango into the blender cup. Scrape the peel as best you can. 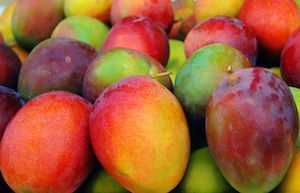 Remove the strip of peel left around the mango pit and scrape any fruit into the blender cup. Now comes the really messy part, scrape the mango pit to remove what flesh is left attached to it. Scraping is better than cutting because you don't want the fibers in the smoothie. If some fibers get in, don't worry about it. Set aside. Boil the two tablespoons of oatmeal in one and a quarter cups of water. If you are going to use salt, add it before you start cooking the oatmeal. Bring to a gentle boil, turn off the heat and stir until it stops bubbling. Add the oatmeal to the mango in the blender cup and blend at high speed until smooth. That's it! Last updated June 2, 2016.